The Gustavus men's hockey team will make its second consecutive tournament appearance when it hosts familiar foe St. Thomas in a NCAA First Round Tournament game on Wednesday night at Don Roberts Ice Rink at 7:00 pm. The Gusties, who won the MIAC Regular Season title, received an at-large bid to the tournament, while St. Thomas, which knocked off the Gusties 2-1 in overtime last Wednesday to win the MIAC Playoff title received an automatic bid to the tournament. The Gustavus men's hockey team suffered a heartbreaking 2-1 loss to St. Thomas in overtime in the MIAC Championship Playoff game on Wednesday night in St. Peter. The Tommies got a goal from Chris Hickey at 3:27 of overtime to allow St. Thomas to knock off the top-seeded Gusties at Don Roberts Ice Rink. 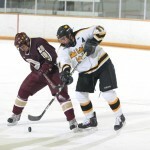 T.J. Ridley scored for Gusties lone goal. 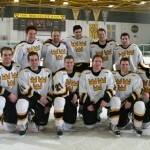 The 2009-10 MIAC Regular Season Champion Gustavus Adolphus men's hockey team is set to complete in the MIAC Playoffs beginning this weekend. The Gusties finished the season with an overall record of 18-5-2 and a MIAC record of 12-2-2 (26 pts). Gustavus will host the winner of Friday night's first round game between St. Olaf and Augsburg on Saturday, Feb. 27, in Don Roberts Arena at 7:05 pm. The Gustavus men's hockey team posted a convincing 6-0 win over Saint Mary's in Winona on Saturday evening and claimed the program's first regular season league title since 1993. Coach Brett Petersen and his squad finished with a conference mark of 12-2-2 (26 points). The Gustavus men's hockey team had set a goal to win the MIAC Regular Season Title at the start of the season and the team reached part of that goal on Friday when it defeated Saint Mary's 5-1 and Hamline tied Concordia 2-2. The Gusties are now assured of at least a share of this year's crown. A win or a tie on Saturday night will give the Gusties the title outright, the first for the program since 1993. Rory Dynan's goal with 1:10 left in regulation play gave the Gustavus men's hockey team a 5-4 win over Hamline and pushed the Gusties (10-2-2, 22 points) back into first place in the MIAC by one-point over Hamline (10-3-1, 21 points). Josh Swartout registered 23 saves and picked up the win in goal for Gustavus. The Gustavus men's hockey team held a 1-0 lead through two periods, but Hamline rallied to score three times in the third period to claim an important 3-1 win and move past the Gusties into first place in the MIAC standings. 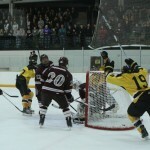 Gustavus' lone goal was scored by Patrick Dynan. The two teams will wrap up the series tomorrow night at 7:05 pm at Drake Arena in St. Paul. The Gustavus men's hockey team got off to a slow start and trailed 1-0 after the first period, however the Gusties scored three times in the second period and twice in the third period to pull away for a 5-1 win over Concordia at Don Roberts Ice Rink on Friday night.